After the monumental success of Mary Poppins, Walt Disney was on a mission to make another blockbuster film musical that could follow it up. He believed he had found the source material in a play based on a book about the life of Cordelia Drexel Biddle called The Happiest Millionaire. Rather than being a fantasy musical like Poppins, Millionaire attempts to be a true life musical. It was the last production started while the studios' visionary leader was still alive. The songwriting team behind Poppins, the Sherman Brothers, were involved from the beginning. They contributed 13 original songs for the film. AJ Carothers adapted the screenplay, having previously done Miracle of the White Stallions and Emil and the Detectives. Norman Tokar was assigned as director, who was one of Walt's go-to directors by this point (Follow Me Boys, The Ugly Dachshund). Fred MacMurray was the only choice to play the lead role and was given star billing, having become a fixture of the Disney Studio for films like The Absent-Minded Professor and The Shaggy Dog. Oscar nominated Greer Garson plays his wife in her only Disney role after a successful career at MGM. Lesley Ann Warren makes her feature film debut as their lovestruck daughter. Her love interest, John Davidson, also makes his film debut here. Walt was priming them to be the next Annette/Tommy Kirk style couple. British pop star Tommy Steele plays John Lawless, their butler and the fourth-wall breaking narrator. Geraldine Page, who would later voice Madame Medusa in The Rescuers, plays Mrs. Duke. Hermione Baddeley appears in her final on-screen Disney role (she voices Madame in 1970's The Aristocats). Eddie Hodges plays one of MacMurray's sons, after costarring in Summer Magic. After the standard Buena Vista logo comes an overture followed by credits set to paintings of high society life. We are introduced to John Lawless, who just arrived in Philadelphia from Ireland, who sings about his "fortuosity" with his upcoming interview by the millionaire Biddle family to be a butler. When he meets his prospective employer, he has just been bit by one of his pet alligators. John gets caught up in a lot of commotion on his first day, including Biddle's sons knocking out a suitor for his daughter Cordelia, who gets furious and contemplates where she belongs. Aunt Mary arrives furious about reading that Cordelia has been boxing in the paper and requests that she go to boarding school. Against her fathers wishes, Cordie wants to go. While there, Aunt Mary takes Cordie to a dance. Attempts at setting her up fail, but she catches the eye of a handsome man named Angier Duke (nickname: Angie). They are instantly smitten and Angie's enthusiasm for cars cause them to begin dating. When she returns from boarding school, she is engaged and her parents haven't met Angie yet, which causes another fight. The story continues after a brief intermission with Cordie's parents meeting Angie. They adjust to him quickly, but the in-laws end up causing a big fight and when Cordie finds ou that Angie will take over the family business instead of following his automobile passions, calling off the wedding. Angie runs off and John chases after him to a bar where Angie gets in a fight and thrown in jail. When they rescue him from jail, the couple makes up and decide to elope to Detroit where Angie is going to get into the car business. Anthony and his wife realize how empty the house feels without Cordie. His wife insists that they let the kids be their own people, but Anthony gets a happy ending when the Navy requests him to become a trainer for the war. The film ends with ending credits and exit music. 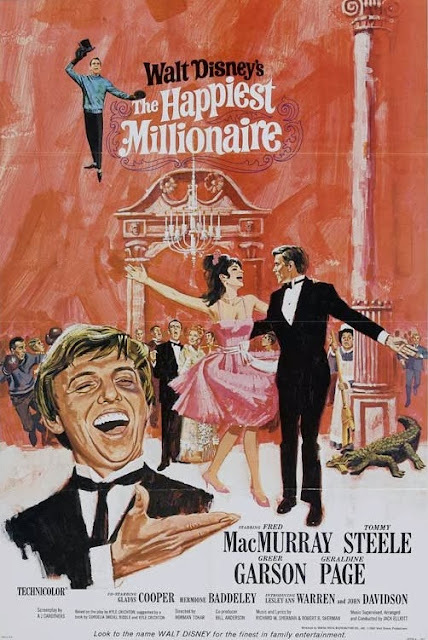 The Happiest Millionaire premiered on June 23rd, 1967 in Hollywood. This was the full 172 minute cut of the film, which included an overture, intermission, and exit music. After having a hard time booking theaters for such a long film, Disney was able to get Radio City Music Hall in New York City to add it to their holiday bill on November 30th, but they mandated that the film be shortened to 159 minutes so they could also run a holiday stage show before the film. This version lost the song "It Won't Be Long 'Til Christmas." After mixed critical reviews, Disney decided to scrap plans for a special Roadshow release and released a further edited version to theaters at 144 minutes. During this run, they decided to release an even shorter cut that ran 118 minutes. It was a critical and box office disappointment, grossing $5 million which would be fine for most live action Disney film of the 60's, but this one cost a considerable amount to make. Possibly due to its length, was one of the few films from this era never to air on Disney's TV series. It remained out of public view until 1984 when Disney Channel was able to restore the original cut (except for a few lost lines of dialogue), and that same year Disney released the film on VHS. Watching Millionaire today, it's hard to see why critics were so harsh on it. This film features some of the finest songs the Sherman Brothers ever wrote (my favorite is "Detroit"). While the runtime is long, the characters are fun and engaging and the pace only gets slow a few times. Lesley Ann Warren and John Davidson steal the show. I think this film simply had the misfortunate of being released after films like Mary Poppins and My Fair Lady, to which it would have inevitably been compared at the time. The film has some great choreography by Marc Beaux and Dee Dee Wood, who also choreographed Poppins. Pieces of the sets can be found at Disneyland. The Biddle's phone booth was installed in the exclusive Club 33 and pieces of the bar set are in Cafe Orleans. "Fortuosity" and "Let's Have a Drink on It" can also be heard on Main Street USA at Disneyland and Walt Disney World. To date, this was the last reserved-seat experience Disney has attempted (the only other one was Fantasia). It's interesting that Walt chose this as his follow up to Poppins because while both films are about turn-of-the-century families, the major themes are at opposite ends of the parental spectrum. Mary Poppins is truly a story about an absent father learning that his children are the most important thing in his life. The Happiest Millionaire is about an involved father learning to let go as his children grow up. Perhaps this theme hit close to home since Walt's daughters were grown and married by this time. The film may be too happy-go-lucky for the average viewer, but should be required viewing for any Disney fan. The Happiest Millionaire is currently available on DVD, where its original Roadshow length has been restored, intermission and all. The film is presented in non-anamorphic widescreen (1.66:1). While a restoration was done, this release does have some issues where the image is routinely blurred. There aren't any bonus features. It is also available on iTunes, where the run time is 5 minutes shorter than the DVD (presumably losing the overture, intermission, and exit), but iTunes has the film in HD. While I wouldn't recommend the shortened version because it goes against the original filmmakers intentions, the 144 minute version was released on DVD by Anchor Bay in 1999 and can be found on the second hand market. What is the name of the car that Angie Duke drives during the "Detroit" number?